See the wedding brochure for more details. You and your guests can enjoy our small deck overlooking our one acre pond and native demonstration meadow. This outdoor venue accommodates up to 100 people. 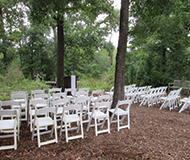 Enjoy your wedding by a quiet nature pond teeming with wildlife and surrounded by trees; your guests are seated in white chairs along the pond. This outdoor venue accommodates up to 150 people. Gorgeous indoor settings overlook the forest. 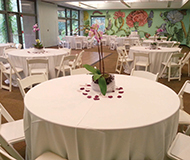 White chairs and aisle runner provided This venue accommodates up to 150 people. All rooms have the forest as their backdrop. 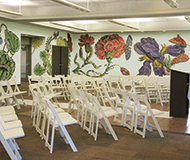 This venue accommodates up to 150 people. 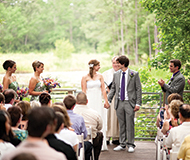 Follow Houston Arboretum’s board Weddings at the Arboretum on Pinterest. For more information, fill out our rental inquiry form or contact Rentals Coordinator, Carol Nicolaisen, via email.